THE Uttar Pradesh Police on Friday sacked three station house officers, suspended three constables and arrested two former policemen for allegedly posting on social media in favour of their colleague Prashant Chaudhary, who is accused of killing Apple executive Vivek Tiwari on September 29. The constables had sported black armbands on social media as a mark of protest. 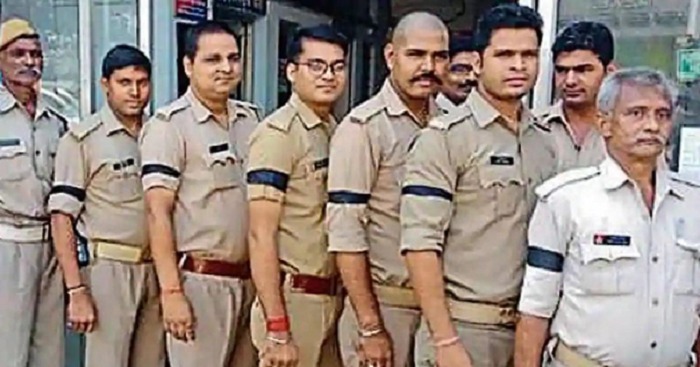 Uttar Pradesh Deputy Inspector General of Police (Law and Order) Praveen Kumar said constables Jitendra Kumar Verma, Sumit Kumar and Gaurav Chaudhary were suspended on Friday for “creating dissatisfaction among fellow constables”, The Indian Express reported. He said departmental inquiries were underway. Lucknow Senior Superintendent of Police Kalanidhi Naithani sacked the station house officers of Aliganj, Gudamba and Naka Hindola police stations, where Verma, Kumar and Chaudhary work, for lack of supervision. Varanasi Cantonment Police Station officer Raju Ranjan said former constable Vijendra Yadav was arrested for allegedly inciting policemen to protest the arrest of their colleague. Ranjan said Yadav had asked colleagues not to eat at the police mess. Another former constable, Avinash Pathak, was also held. Chief Minister Adityanath met Tiwari’s wife on October 1 and accepted all her demands, including a state government job for her and a Special Investigating Team to inquire into the killing. Next articleJOKE OF THE DAY: DCP Akhilesh Singh says not one Senior Inspector uses AC and LED TV in his zone! !